During her visit to Saba and Bonaire, Sharon Dijksma, Dutch Minister for Agriculture, opened a shark sanctuary. Shark populations throughout the world are in steep decline, so these animals need extra protection against illegal fishing. Steps also need to be taken to reduce shark by-catch by the regular fishing industry. Local nature conservation and fisheries organisations are involved in these protection measures. In creating this shark sanctuary, the eleventh of its kind in the world, the Netherlands aims to actively protect sharks in the Caribbean Sea. Research carried out by Imares has shown that, as predators, a decline in shark numbers will increasingly upset the natural balance in the sea. This could affect fish stocks throughout the region. Healthy fish stocks are important for fishermen on the islands, who are dependant on their catches. Tourism also benefits from coral reefs that have sharks. Good news. 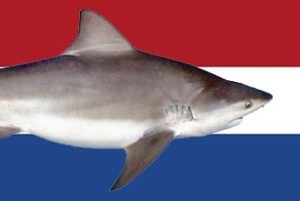 The associated image appears to show a species of river shark over the Dutch flag, or it is a bull shark. If it is a river shark, being an exceptionally rare shark found in Borneo I just wanted to check that the source of the image, and therefore the capture of that individual is known to the relevant scientists.